Auteur : Herzberg Abel J. At the height of the Holocaust it was Nazi policy to preserve small groups of *privileged* Jews for possible use in exchanges with Allied-held German civilians. 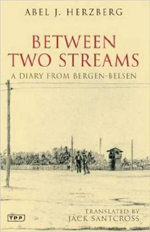 One such internee--Abel Herzberg, a Dutch lawyer and writer--managed in the hell of Bergen-Belsen to keep a diary which chronicles the reality of daily existence in the camp, with its grotesquely dehumanizing conditions and the magnanimity and pettiness which they engendered. Among the passengers on the train that carried Herzberg both to Belsen and away from the camp a year later was a 9-year-old boy. Extraordinarily, that same boy--Jack Santcross--undertook to translate Herzberg's diary half a century later. The result is this unique eye-witness account of life in one of the most notorious Nazi concentrations camps and a work of great historical importance.